"Celebrating God's Love & Sharing It With Others," we find additional time reading in the Bible beyond Sunday worship makes God's love even more real to us. Whatever faith level you are at, you are welcomed to join in. Questions? Or are you in need of a Bible? Feel free to call. A great way to study the Bible at home? Sign-up & receive a daily devotional called Today. Or download their mobile app for either Android or IOS. Click here to learn more. Are you new to devotionals? Download this great guide. We also have standard and large print versions of the Today devotionals available on-site. The Adult Sunday School Class meets on Sunday mornings throughout the year following the worship service. Discussions center on gaining additional nuggets from the morning sermon. It is also a safe place to bring your questions and find answers as we support each other in our faith walk with Jesus. This season's Monday Afternoon Fellowship Group meets twice per month. A lunch together and visiting time precedes the lesson with food and drink provided. 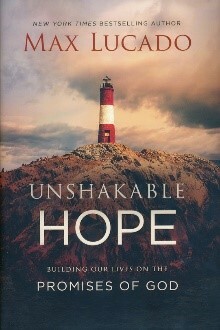 We are just starting a new series by Max Lucado, “Unshakable Hope: Building Our Lives on the Promises of God”. Individuals and couples are welcomed to join this study. Our Ladies Bible Study meets on Thursdays from 10 am to noon. If you have your Thursday mornings open and wish to join in, please give us a call.